I LOVE picking out Christmas presents for my friends and family. However, it can also be very stressful. I want to make sure that I’m gifting something that they will love and probably wouldn’t have purchased on their own. As someone who loves to entertain, I’m always looking for products that will help me present a stunning meal and presentation from start to finish. Even if I’m just having people over for a game night, I want them to love every second! Here is my list of 5 Holiday Gifts for the entertainer in your life! For those of you who follow my recipe posts, you probably know how much I LOVE my Copper Chef! It is perfect for weeknights when I’m just cooking for two, but it is also FANTASTIC for making larger amounts of food when I host dinner parties. 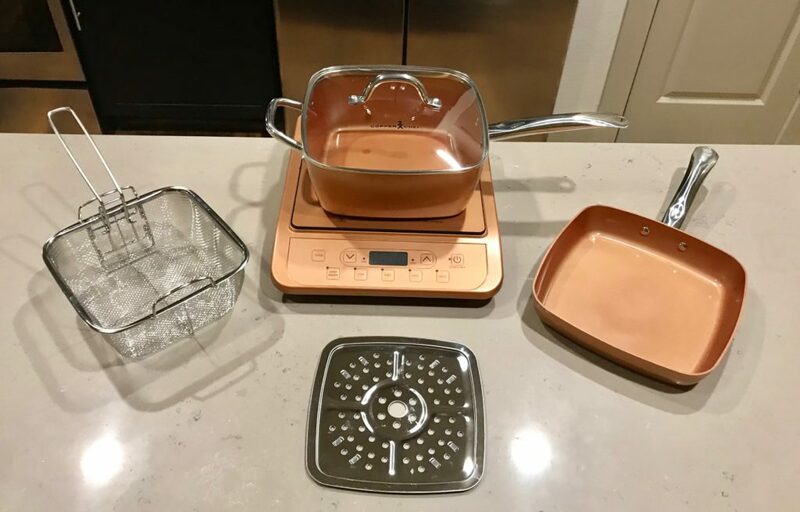 I purchased the Copper Chef 5-Piece Cookware Set and Copper Copper Chef Induction Cooktop off of Amazon. The 5-Piece set comes with the 9 1/2 inch pan, Glass Lid, Fry Basket, Steam Rack, Square Fry Pan and Recipe Book. I also purchased the Copper Chef Induction Cooktop. The Induction Cooktop is extremely helpful because it keeps your stovetop available to cook other dishes on your stovetop. 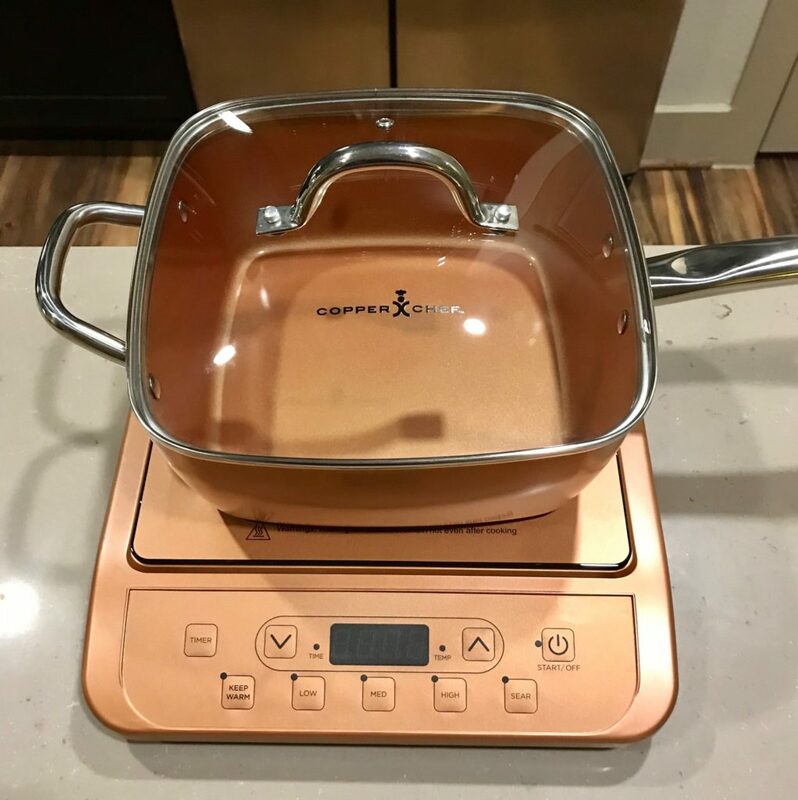 The Copper Chef has a stainless steel induction plate on the bottom that allows for fast and even cooking. It is also non-stick, so you don’t have to cook with oil or butter. This makes cleaning the pan a breeze and it is dishwasher safe! It is safe to use on all stovetops and you can even place it in the oven! There are multiple package options available or you can just buy the Copper Chef by itself. I already have several more products from Copper Chef on my Christmas wish list this year. The Copper Chef is an entertainer’s dream! One tip, you might want to give this gift a bit early this year so that they can use it for their holiday entertaining! Oh the Roomba . Where do I even start! Now this gift is on the pricier side, but it is definitely a winner. We received the Roomba as a wedding present and I don’t remember how I kept my floors clean before owning the Roomba. I must give my husband the credit for this one. I was hesitant to even register for this, but I am so glad I did. Yes, it is on the pricier side, but it is TOTALLY worth it! There are multiple versions of the Roomba depending on your specific needs. For example, our Roomba has patented tangle free brushes that prevent pet and human hair from getting stuck and tangled. We don’t have any pets, but I have long hair and this is a lifesaver! You can also program the Roomba to run at certain times on certain days. So basically, you never have to think about vacuuming! You can also purchase an iRobot Virtual Wall Barrier that will keep the Roomba from bumping into certain pieces of furniture or entering a room at all! 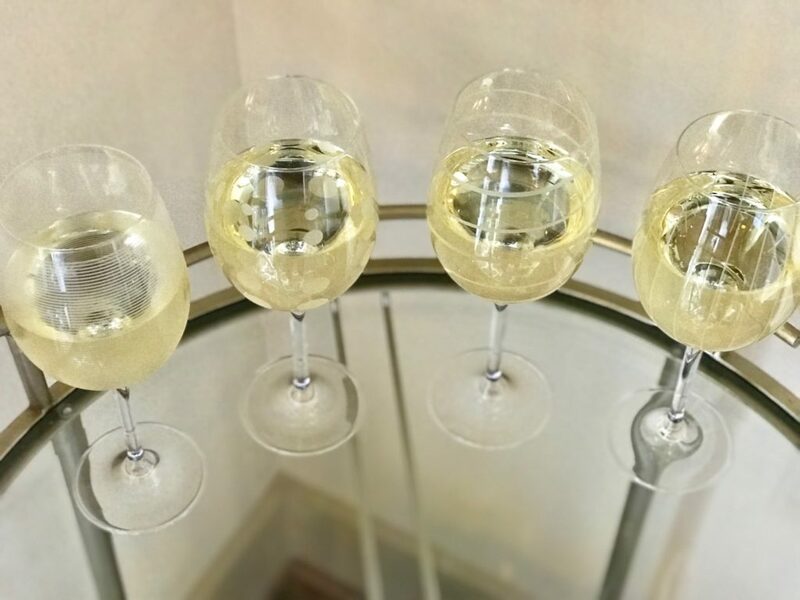 The Roomba is super gentle when it does bump a wall, so it doesn’t cause any damage, however, even if it lightly bumps our bar car, it could cause our hanging wine glasses to break. The virtual wall prevents the Roomba from getting too close to our bar cart! Most of the Roombas also come with an app where you can schedule it to run from anywhere! The navigation system helps it maneuver around your furniture and it is low enough that it fits under most pieces of furniture in our home. This was a big deal for me, because let’s be honest, I’m not moving furniture every time I need to vacuum, so without the Roomba it is like waiting to see how much dust has collected under that piece of furniture when we move one day. 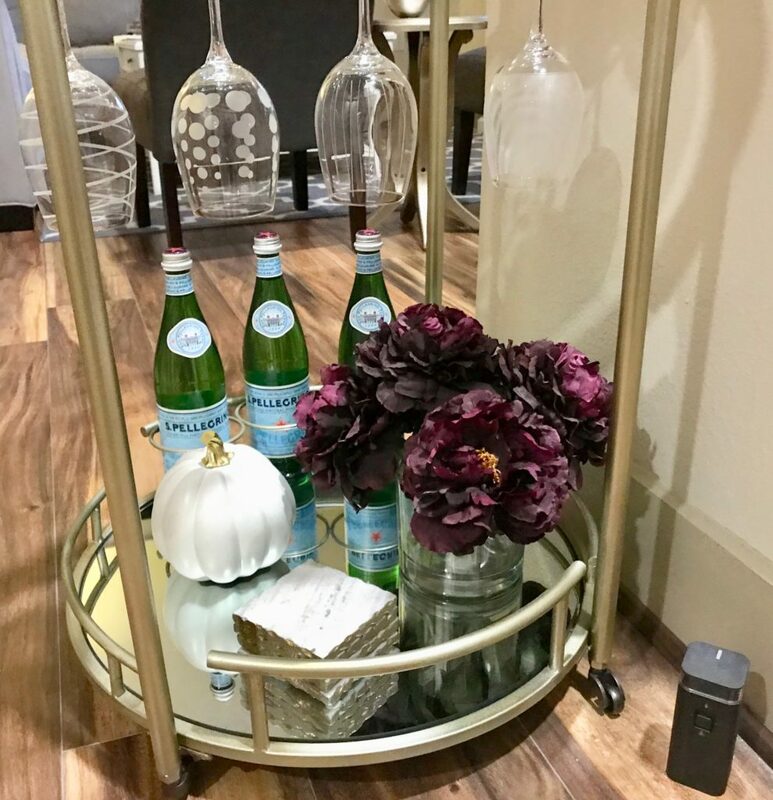 This really comes in handy for entertaining because I don’t have to spend an hour vacuuming right before company arrives! I just press a button and let the Roomba do its thing while I cook or get myself ready. It honestly feels like we have a housekeeper here every day! I love having the lines in my carpet after the room has been vacuumed! Check out my full review on the Roomba here. 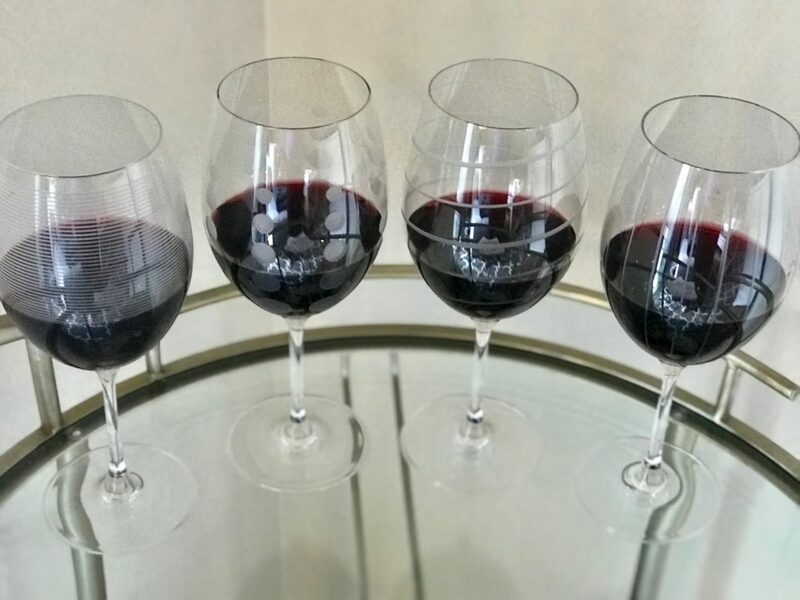 The Mikasa Cheers Wine Glasses are a must for all of my wine lovers out there! First, they are absolutely beautiful and have four different coordinating designs per set. This adds a stylish aspect to the glasses, but it is also very helpful for being able to identify your glass during a dinner party. How many times have you lost track of which glass was yours at a dinner party? I don’t like drinking after other people, so this has always been so annoying to me! With the Mikasa Cheers Wine Glasses , you don’t have to worry! The collection includes multiple styles of glasses, so there is a glass for all of your favorite beverages! For example, I love these Mikasa Cheers Stemless Wine Glass . They are perfect a yummy cocktail or serving a beautiful custard or ice cream for dessert! They also have Mikasa Cheers Martini Glass , Mikasa Cheers Champagne Flutes , and Mikasa Cheers Beer Glasses to satisfy everyone at your party. Several of my friends have told me that they always get so excited to drink out of these glasses when they come over for a dinner party or game night! Now that you have the perfect glasses, it’s time to open that bottle of wine! Normal corkscrews don’t always work and let’s be honest, they have been known to make you break a sweat and nobody wants that while hosting guest. Let’s not even talk about those embarrassing times the cork broke! This Oster Electric Wine Bottle Opener makes opening a bottle of wine a breeze and also serves as pretty handy party trick! 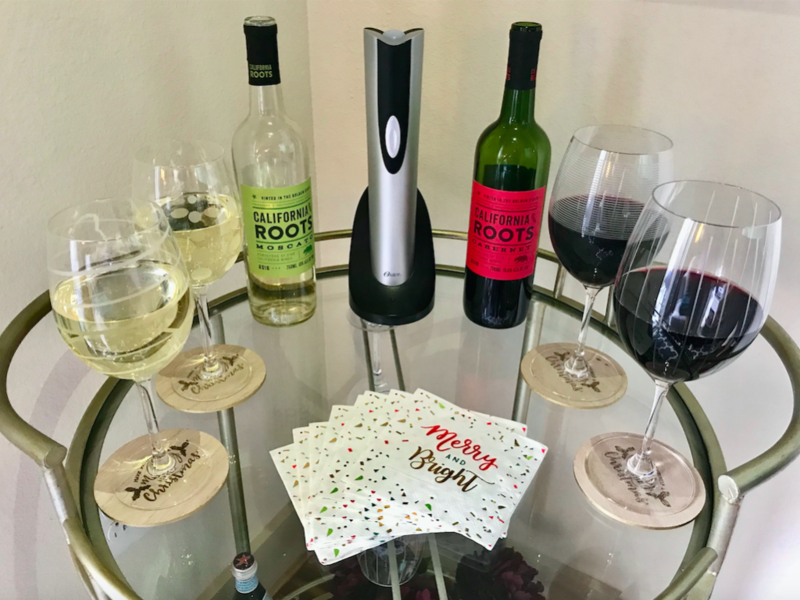 It will open 30 bottles of wine on a single charge and has a stylish charging station that is small and looks great on your countertop or bar! Let one of your guests try it out, it is a great conversation piece! 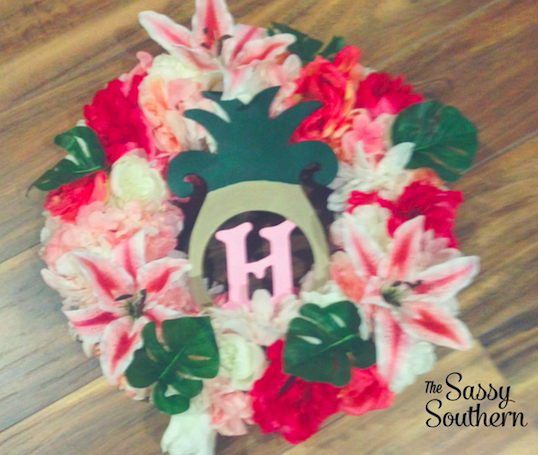 This one is not as expensive and will be a very popular white elephant or secret Santa gift! They also have an Oster Cordless Wine Opener with Chiller combo pack to make opening and chilling a breeze! If you are feeling extra generous, throw in a bottle of wine, too! 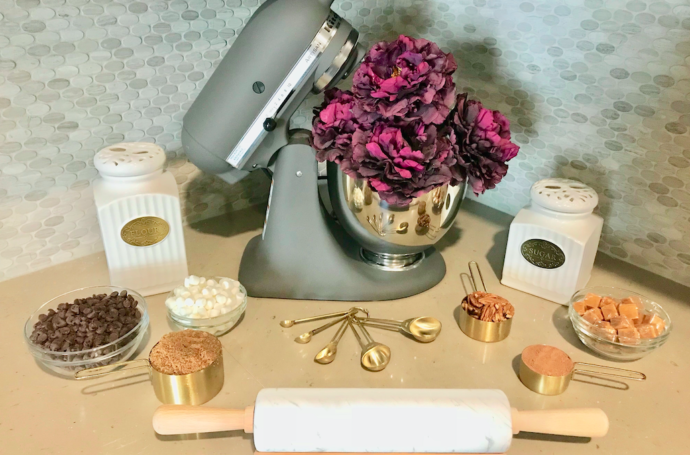 Who doesn’t love the KitchenAid Stand Mixer? 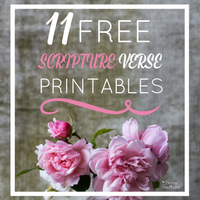 It has almost become a kitchen staple or décor piece for your countertop! With so many colors and styles to choose from, you can find the perfect Kitchen Aid Stand Mixers to fit your kitchen! When the hubs and I were registering for our wedding, I made a beeline for the KitchenAid Stand Mixers. I knew the exact color and style I wanted to register for. 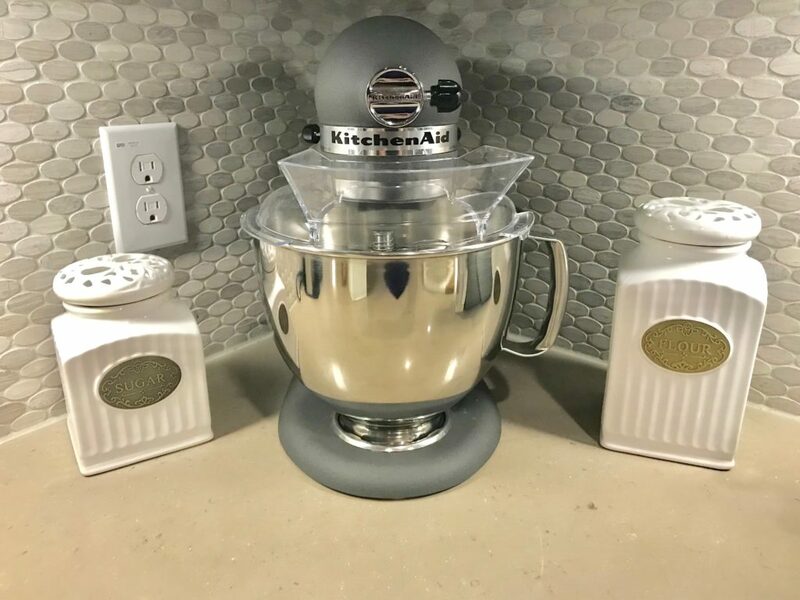 We decided to go with this KitchenAid Artisan Series 5-Qt. 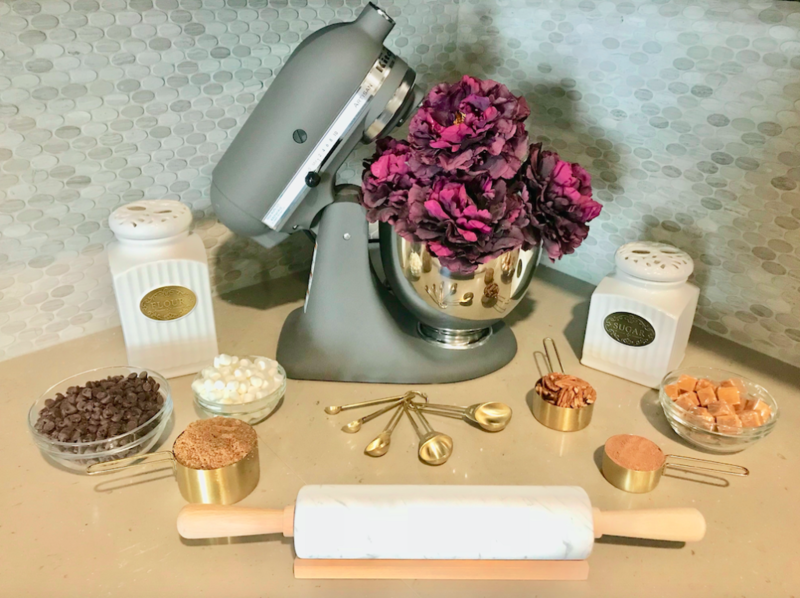 Stand Mixer with Pouring Shield In Imperial Grey and I so was thrilled when my amazing team at work purchased this for my work wedding shower! I’ll be honest, I was a little bit intimidated at first, but it is SO EASY to use and is a lifesaver in the kitchen! It saves me so much time and my hands and arms are so thankful for the break! The KitchenAid Spiralizer Plus Attachment with Peel, Core & Slice is currently on my Christmas list! There are so many different attachments available and to help you create recipes you never thought would be possible! While this is on the pricier side, it is the perfect gift for the chef in your life! Coffee, iced coffee, tea, hot chocolate, apple cider, you name it, the Keurig Coffee Maker does it all! This is especially wonderful if not everyone in your home loves coffee or tea. That is definitely the case in our home. Jeremy can’t stand coffee! However, he does love hot chocolate, so the Keurig is perfect for both of us! I don’t have to make a full pot of coffee that will go to waste when I’m the only one drinking it! With so many different K-Cup options, there is something for everyone. 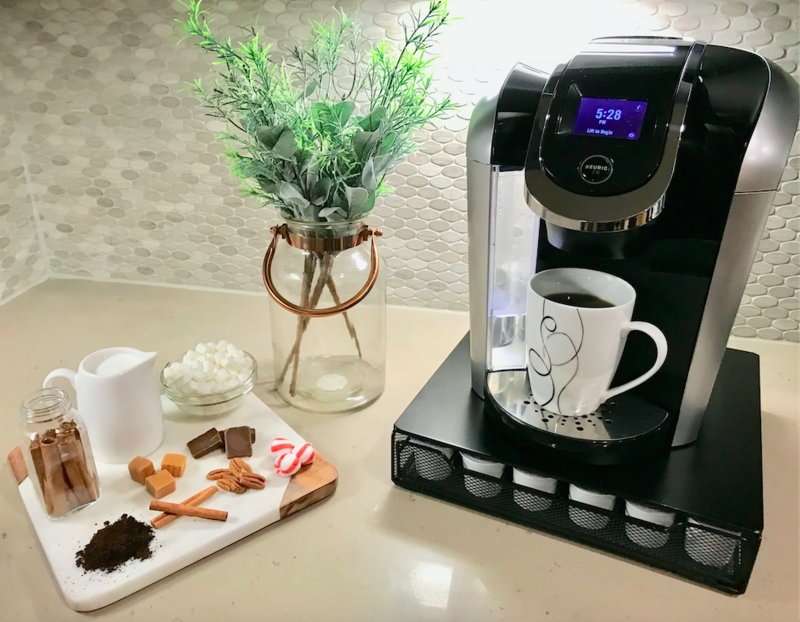 Keurig also has a The Keurig Rivo Cappuccino and Latte System that is definitely on my Christmas list! While this is initially an expensive purchase, think of how much money and time you will save by skipping Starbucks every day! 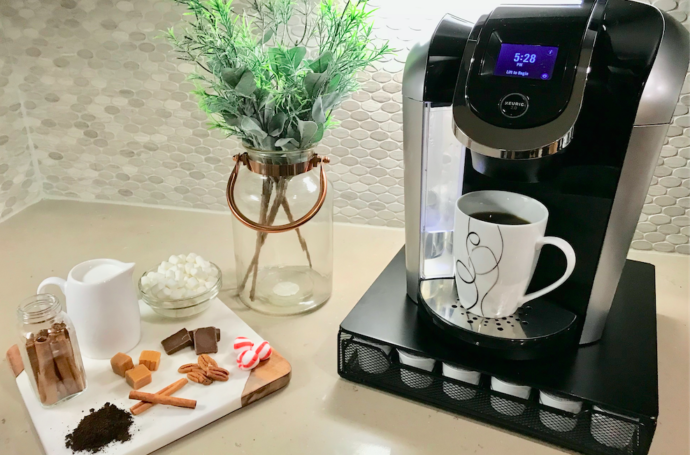 Check out my breakdown of how much I save every year on coffee since switching to a Keurig Coffee Maker !It is also great when you have guests over. If you need a large carafe of coffee for a brunch or dinner party, you can purchase a Keurig Thermal Carafe and brew a large pot. However, if you only have one or two guests, your guests can each pick a different flavor to suit their taste! I also love the K-cup Storage Drawer that goes under your Keurig! It doesn’t take up any extra counter space and it super convenient for having your K-Cups ready to brew! I’m always looking for new ways to entertain! What are your favorite entertaining products? Great suggestions. I would like all of them but especially liking the Rumba. I always love new gift ideas and it’s especially great to have your personal experience with the items. Thanks! What a fantastic list for the entertainers on your gift list! I LOVE my Kitchen Aid!! That Copper Chef Pan has been on my list for a couple years, lol. But that electric wine opener! Yes, please! I just put that on my wish list for this year, haha! Those measuring cups are gorgeous!! I find the Roomba very interesting! It would be fun to skip out on cleaning floors! Lol, Chloe! I LOVE not having to actually vacuum anymore. It is wonderful. Thank you for reading! love your blog and pictures! I want the wine opener!! Thank you so much, Merav! I LOVE that wine opener so much! It really is so easy to use!